At the risk of sounding vague, the first thing to know about Heide Fasnacht is that she is an artist who understands the shape of things and places. 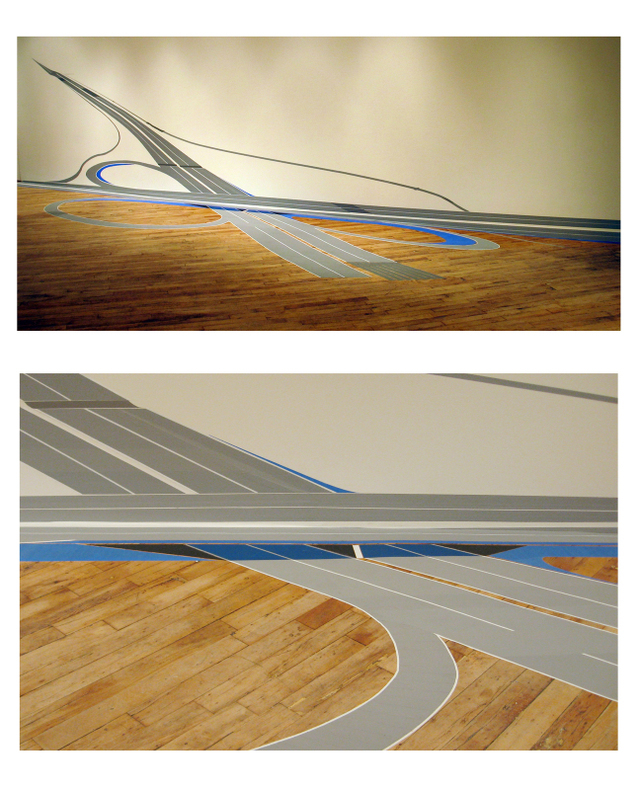 In her newest show at Bernard Toale Gallery, she takes on those ubiquitous hieroglyphics of urban highway interchanges, so familiar to anyone who has seen them from the air. In a series of drawings and one wall installation, Fasnacht prises those shapes away from much of their context to reveal the graceful symmetry and patterns, so unintentionally aesthetic: a byproduct of designs intended to keep people moving fluidly and efficiently in different directions. While Fasnacht’s drawings capture the iconic nature of these shapes, it is her installation that changes the work from bland observational urban landscape into something else entirely. Like the playful shimmer of a Bridget Riley, or the horizonless confusion of James Turrell, her optic-illusional installation makes the eye’s understanding of space cunningly flip-flop: now you see the lines of the gallery wall, now you see the lines of the architectural shape on that wall. The ultimate result is that the shape of the thing itself breaks free of all boundaries and holds court as a distinct presence, demanding the viewers’ full attention. Fasnacht has made a career working at the interchange of forced perspective and real space, and her best works are the tape and contact paper wall installations which leap from corners into the viewer’s perceived field of vision. Confronted with such an intense created space, the viewer if left to meditate on the shape and meaning of the illusion. Related: Heide Fasnacht at Kent Gallery in NYC is reviewed in this month’s Art in America.